A battery is a galvanic cell whose purpose is to store chemical energy and release it in the form of electrical work when needed. 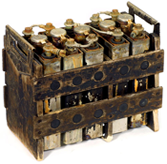 Batteries came into industrial use with the development of telegraphy in the mid-19th Century. By 1900, they had enabled the development of the telephone, railway signalling, and the electric automobile, and soon became widely available consumer products. In the present age of personal electronics, renewable energy and modern electric vehicles, they have become essential parts of modern society. One of the oldest and most important applications of electrochemistry is to the storage and conversion of energy. You already know that a galvanic cell converts chemical energy to work; similarly, an electrolytic cell converts electrical work into chemical free energy. Devices that carry out these conversions are called batteries. In ordinary batteries the chemical components are contained within the device itself. If the reactants are supplied from an external source as they are consumed, the device is called a fuel cell. 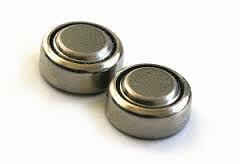 The term battery derives from the older use of this word to describe physical attack or "beating"; Benjamin Franklin first applied the term to the electrical shocks that could be produced by an array of charged glass plates. In common usage, the term "cell" is often used in place of battery. A good source of information on all aspects of batteries can be found at the Battery University site. Effective surface area of the electrode. A 1-cm2 sheet of polished metal presents far less active surface than does one that contains numerous surface projections or pores. All useful batteries and fuel cells employ highly porous electrodes. Recent advances in nanotechnology are likely to greatly improve this parameter. Current density of electrode surface. Expressed in amperes m–2, this is essentially a measure of the catalytic ability of the electrode, that is, its ability to reduce the activation energy of the electron transfer process. Rate at which electroactive components can be delivered to or depart from the active electrode surface. These processes are controlled by thermal diffusion and are inhibited by the very narrow pores that are needed to produce the large active surface area. Side reactions and irreversible processes. The products of the discharge reaction may tend to react with the charge-storing components. Thermal diffusion can also cause self-discharge, limiting the shelf life of the battery. Recharging of some storage batteries may lead to formation of less active modifications of solid phases, thus reducing the number of charge/discharge cycles possible. Clearly, these are all primarily kinetic and mechanistic factors which require a great deal of experimentation to understand and optimize. A secondary or storage battery is capable of being recharged; its electrode reactions can proceed in either direction. During charging, electrical work is done on the cell to provide the free energy needed to force the reaction in the non-spontaneous direction. A primary cell, as expemplified by an ordinary flashlight battery, cannot be recharged with any efficiency, so the amount of energy it can deliver is limited to that obtainable from the reactants that were placed in it at the time of manufacture. The most well-known storage cell is the lead-acid cell, which was invented by Gaston Planté in 1859 and is still the most widely used device of its type. The reaction proceeds to the right during discharge and to the left during charging. The state of charge can be estimated by measuring the density of the electrolyte; sulfuric acid is about twice as dense as water, so as the cell is discharged, the density of the electrolyte decreases. The sulfuric acid electrolyte becomes quite viscous when the temperature is low, inhibiting the flow of ions between the plates and reducing the current that can be delivered. This effect is well-known to anyone who has had difficulty starting a car in cold weather. These batteries tend to slowly self-discharge, so a car left idle for several weeks might be unable to start. Over time, PbSO4 that does not get converted to PbO2 due to lack of complete discharge gradually changes to an inert form which limits the battery capacity. Also, "fast" charging causes rapid evolution of hydrogen from the water in the electrolyte; the bubbles form on the lead surface and can tear PbO2 off the positive plate. Eventually enough solid material accumulates at the bottom of the electrolyte to short-circuit the battery, leading to its permanent demise. Despite its name, this cell is not really "dry"; the electrolyte is a wet paste containing NH4Cl to supply the hydrogen ions. The chemistry of this cell is more complicated than it would appear from these equations, and there are many side reactions and these cells have limited shelf-lifes due to self discharge. (In some of the older ones, attack by the acidic ammonium ion on the zinc would release hydrogen gas, causing the battery to swell and rupture, often ruining an unused flashlight or other device.) A more modern version, introduced in 1949, is the alkaline cell which employs a KOH electrolyte and a zinc-powder anode which permits the cell to deliver higher currents and avoids the corrosive effects of the acidic ammonium ion on the zinc. Although the development practical batteries largely paralelled the expansion of electrical technology from about the mid-19th century on, it is now thought that a very primitive kind of battery was apparently in use more than 2000 years ago. The brief popularity of electrically powered automobiles in the 1920's encouraged storage battery development. The widespread use of portable "personal" electrical devices — and more recently, the return of electrically-powered vehicles, has kept the search for better batteries very much alive. See here for some interesting pictures of very early electrochemistry cells. 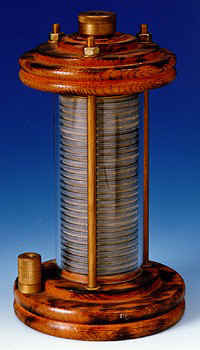 John Daniell (English chemist and meterologist) developed the first modern storage cell based on Faraday's principles. This consists of a large glass jar with a copper star-shaped electrode in the bottom and a zinc "crow's foot" shaped electrode suspended near the top. 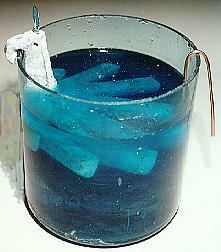 The bottom of the jar was filled with a concentrated copper sulfate solution. On top of this was poured dilute sulfuric acid, whose lower density kept it on top. This was the first practical battery to find wide use to power telegraphs, railway signaling systems and home doorbells. 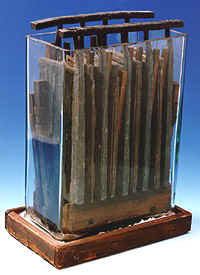 Planté invents the first lead-acid storage cell which consisted of two sheets of lead separated by a rubber sheet, rolled into a spiral and immersed in dilute sulfuric acid. 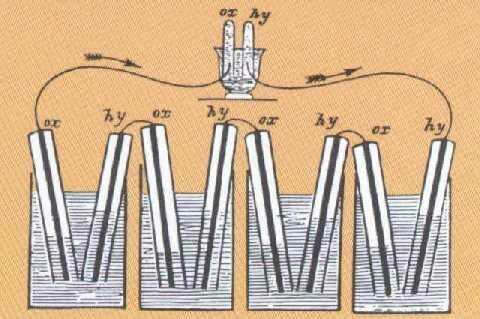 By 1868 twenty thousand Leclanché cells were being used in telegraph systems. 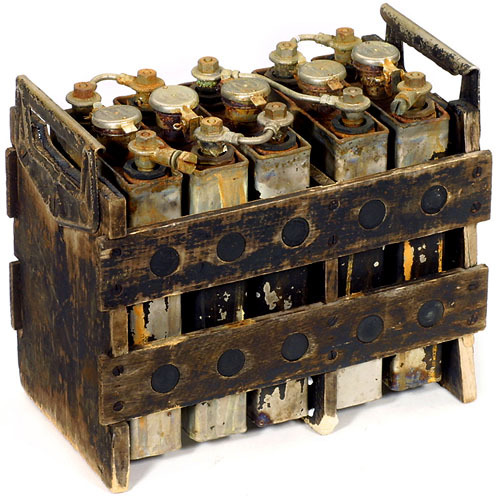 The original Leclanché cells were built in porous pots which were heavy and subject to breakage. ~1900 - the Leclanché "Dry Cell"
The success of the Leclanché cell inspired various inventors to develop a "dry" version that would be conveniently portable and not subject to spilling. The first patent for such a device was issued in Germany in 1886. 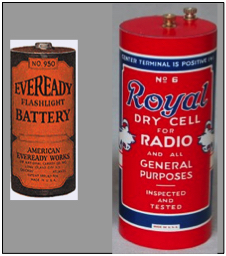 In 1898, an improved version (the first "D" cell) began mass production in the U.S. As the first batteries marketed to ordinary consumers, these became widely used in the first flashlights (1909) and in battery-powered radios of the 1920s. 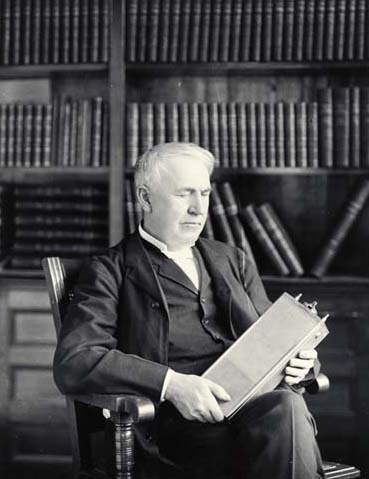 Thomas Edison, who was as much a chemist as an all-around inventor, thought that the lead in Planté-type cells made them too heavy, and that having acid in contact with any metal was an inherently bad idea. After much experimentation, he developed a successful alkaline battery. 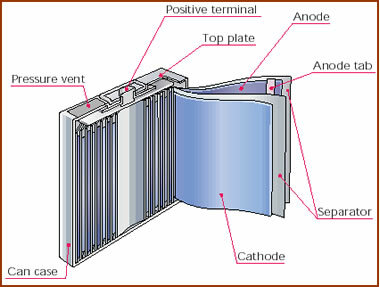 The Edison cell uses an iron anode, nickel oxide cathode, and KOH electrolyte. This cell is extremely rugged and is still used in certain industrial applications, but it was never able to displace the lead-acid cell as Edison had hoped. The original dry cells tended to corrode badly as they aged, often splitting open and ruining devices such as flashlights. Today's alkline batteries substitute KOH for the corrosive NH4Cl used in the older dry cells and last 5-8 times longer. 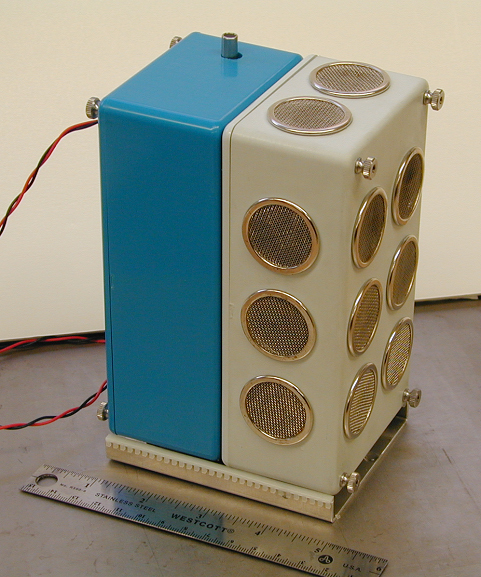 This was one of the first "button"-type dry cells which were widely used in cameras and hearing aids. The constancy of the 1.34 v output made them popular for use in sensitive instruments and cardiac pacemakers. The first Ni-Cd batteries where developed in Sweden in 1899, and by Edison in 1901; large-scale manufacture in the U.S. commenced in 1946. The NiCad cell quickly become one of the most popular rechargeable batteries for small consumer devices. They can deliver high current and undergo hundreds of charge–discharge cycles. Because cadmium is an environmental toxin, their use is being discouraged. See this Wikipedia article for a very thorough description of current lithium battery technology and for recommendation on how to store and use these cells. There have been numerous reports of fires and explosions associated with lithium batteries. In 2006, the Dell Corporation had to recall 4.1 million Sony batteries that had been shipped with Dell's laptop computers and were judged to be at risk owing to a manufacturing defect. This illustrates the difficulty of concentrating a large amount of chemical energy into a small package, which is of course the goal of all battery developers eager to meet commercial demands ranging from consumer personal electronics to electrically-powered cars. The fully-charged Li+-deficient lithium cobalt oxide cathodes are inherently unstable, held in check only by a thin insulating membrane which, if accidentally breached, can lead to thermal runaway involving gaseous oxygen, carbon, organic solvents, and (in some cases) lithium chlorate— all the components necessary for a fierce fire. Finally, we should mention the biological batteries that are found in electric fish, of which there are more than 300 species. The "electric organs" of these fish are modified muscle cells known as electrocytes which are arranged in long stacks. 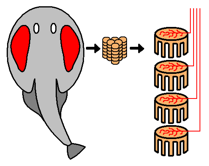 A neural signal from the brain causes all the electrocytes in a stack to become polarized simultaneously, in effect creating a battery made of series-connected cells. Most electric fish produce only a small voltage (0.1-10 volts) which they use for communication or navigation. In one form of electrolocation, the fish generates a continuous low frequency wave-like field. These fish are able to sense distortions in this field that are produced by nearby objects. The electric eel (electrophorous electricus) does not actually belong to the eel family. Others, known as strongly-electric fish, can produce much higher voltages which they use to stun their prey. Those who live in salt water exploit its higher conductivity by producing lower-voltage, but high current discharges. 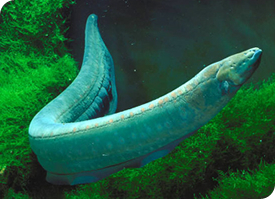 The famous electric eel has three electric organs, which occupy most of its body. The main organ is made up of over 5000 stacked electrocytes which can put out a much as 680 volts at a current of 1 ampere. Because the pulse duration is only two milliseconds, its shock is not considered fatal to humans. The other two organs are used for electrolocation and produce only low voltages. 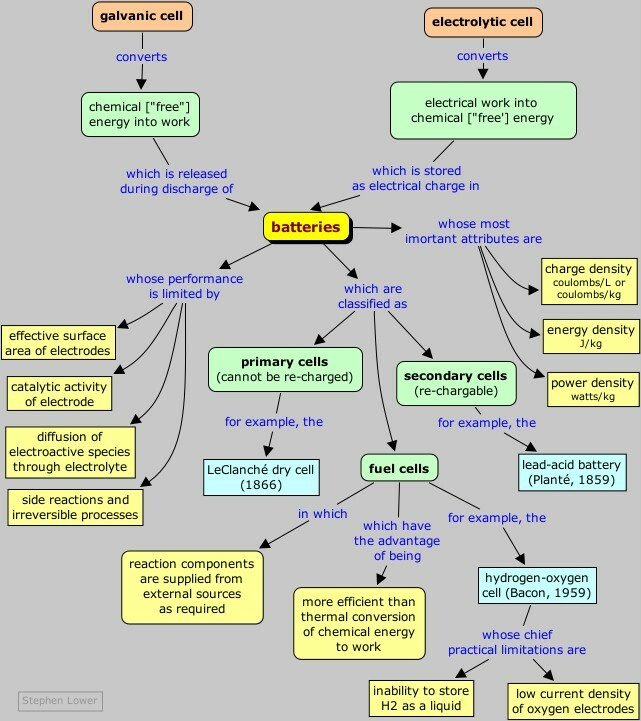 Conventional batteries supply electrical energy from the chemical reactants stored within them; when these reactants are consumed, the battery is "dead". An alternative approach would be to feed the reactants into the cell as they are required, so as to permit the cell to operate continuously. In this case the reactants can be thought of as "fuel" to drive the cell, hence the term fuel cell. The first fuel cell was invented by a lawyer! Although hydrogen has the largest energy-to-mass ratio of any fuel, it cannot be compressed to a liquid at ordinary temperatures. If it is stored as a gas, the very high pressures require heavy storage containers, greatly reducing its effective energy density. Some solid materials capable of absorbing large amount of H2 can reduce the required pressure. Other fuels such as alcohols, hydrocarbon liquids, and even coal slurries have been used; methanol appears to be an especially promising fuel. 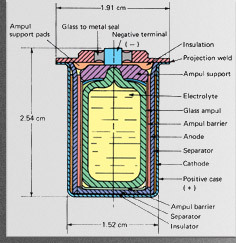 Schematic diagram of a modern hydrogen-oxygen fuel cell. Commonly used electrolytes are NaOH solution, phosphoric acid, or solid oxides. A major limitation of any oxygen-consuming fuel cell is the slow rate of the reduction of this element at a cathode. The best cathode surfaces are usually made of platinum, which is a major cost factor in fuel cell design. One reason for the interest in fuel cells is that they offer a far more efficient way of utilizing chemical energy than does conventional thermal conversion. The work obtainable in the limit of reversible operation of a fuel cell is 229 kJ per mole of H2O formed. If the hydrogen were simply burned in oxygen, the heat obtainable would be ΔH = 242 kJ mol–1, but no more than about half of this heat can be converted into work so the output would not exceed 121 kJ mol–1. This limit is a consequence of the Second Law of Thermodynamics. The fraction of heat that can be converted into work is a function of how far (in temperature) the heat falls as it flows through the engine and into the surroundings; this fraction is given by (1 - Thigh)/Tlow. At normal environmental temperatures of around 300K, Thigh would have to be at least 600 K for 50% thermal efficiency. The major limitation of present fuel cells is that the rates of the electrode reactions, especially the one in which oxygen is reduced, tend to be very small, and thus so is the output current per unit of electrode surface. Coating the electrode with a suitable catalytic material is almost always necessary to obtain usable output currents, but good catalysts are mostly very expensive substances such as platinum, so that the resulting cells are too costly for most practical uses. There is no doubt that if an efficient, low-cost catalytic electrode surface is ever developed, the fuel cell would become a mainstay of the energy economy. Smithsonian fuel cell project A well-designed site with information on many types of fuel cells and a nice section (with pictures) of early ones. Certain types of bacteria are able to oxidize organic compounds to carbon dioxide while directly transferring electrons to electrodes. These so-called electricigen organisms may make it possible to convert renewable biomass and organic waste directly into electricity without the wasted energy and pollution produced by direct combustion. 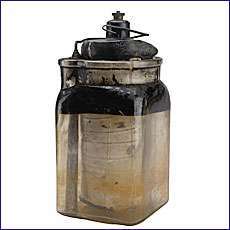 In one experiment, a graphite electrode immersed in ordinary mud (containing humic materials) was able to produce measurable amounts of electricity. Chem1Electrochemical Energy Storage surveys the fundamentals of batteries and fuel cells for a course in General Chemistry. It is part of the General Chemistry Virtual Textbook, a free, online reference textbook for General Chemistry by Stephen Lower of Simon Fraser University . This chapter covers the following topics: Battery basics, primary and secondary batteries, timeline of battery development, biological batters and electric fish, fuel cells. It can be accessed directly at http://www.chem1.com/acad/webtext/elchem/ec-6.html.